It’s that wonderful time of the year! The summer is finally here, the kids have broken up from school, and we’ve all survived what felt like the longest and coldest winter ever! 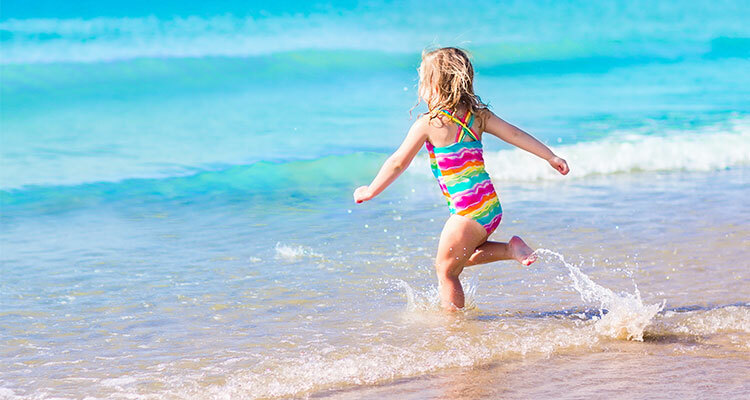 Like most families you are probably thinking about a trip to the beach, getting the paddling pool out, and if you are lucky enough you may have a sunny holiday to look forward to soon. For the majority these plans are always enjoyable, but there are some safety considerations that need to be taken when enjoying time in water or close to it. According to the RLSS (Royal Life Saving Society UK) an average of 700 people drown in the UK each year, and 60% of these are children. With more life changing injuries or near drowning experiences too. Just like Aquatots the RLSS believe that most drownings are preventable. We are extremely proud to say that throughout the whole Aquatots programme, whether just starting out in level one or completing the seven-year course at level 29 we include a safe and fun introduction to swimming. We build on each individual’s water confidence and teach safety skills in every lesson on offer. Babies from the age of ten weeks old up to 10 years of age will learn the fundamentals of water safety and what to do if they ever found themselves or someone in difficulty. Skills such as ‘holding on’ to the side, or at a point of safety are included from that very first day of the programme. If they should ever find themselves in water unaided they would know to hold on until help was available. We also include turning back to the side to hold on to a point of safety too. If one of our swimmers fell into water they would then know exactly what to do! Back floating is a skill we teach throughout the programme, this gets the child to be confident lying on their backs in water which can be used as a resting or rescue technique. It may sound simple, but we also show our swimmers the safest way to enter the water, we talk about jumping in safely to avoid accidents, later on they learn how to judge the water depth they are about to enter and also the safest way of entry into that water. And of course, we show our swimmers the best body positioning and breathing techniques for that ever-anticipated independent swim! We do like to boast that on average we see our swimmers achieve a distance of five metres independently between the age of three and four years. Without buoyancy aids! The national curriculum states that before a child leaves primary school they should be able to ‘swim competently, confidently and proficiently over a distance of at least 25 metres.’ This year we have seen swimmers achieving distances of 1,000 to 2,000 metres before they leave primary school this summer. After they have achieved their 5-metre swim independently, we then introduce simple rescue swimming techniques such as treading water, independent floats, and swimming in their pyjamas! We teach basic rescue methods such as ‘calling for help.’ Using an ‘extended arm’ if necessary to stay on the side, and to not put themselves into danger trying to rescue someone they may see who is. Aquatots are in support with the RLSS to reduce the amount of water incidents that occur every year. We aim to teach each of our swimmers the importance of water safety as well as making them the strong swimmers they will become before they finish primary school. For more details about the benefits of swimming your baby or child you can visit Aquatots for more information. Before setting off on holiday you can research or ask your travel advisor about what water activities are around the area you are staying. It is always good to know if there will be a trained life guard on duty at any local beaches and swimming pools. Your little ones may now have now be used to lovely warm pools and a neoprene nappy which has been ample for their lessons. However, very often those holiday pools aren’t heated, and you as well as your little one may well notice the difference. We always recommend purchasing a wetsuit to take along with you just in case the pool is cooler than you hoped. Do make sure it’s a wetsuit too, as lovely as the popular sunsuits are, their role is UV protection and not keeping the heat in! Why not take a look at our own wetsuits on the Aquatot’s shop. The thin unique fabric retains body heat over 30% higher than a normal neoprene suit and is only 0.5 mm thick but provides the same protection as a 2mm wetsuit. It also offers UVA /UVB protection towards the sun at the same time (factor 50-60%), yet giving minimum buoyancy and drag in the water. They are also great for swimming at your local leisure centre as well as on holiday so well worth the investment. Blue Lips, mottled skin, crying or teeth chattering and tensing / curling up. If this happens you may need that extra warmth or make sure swims are kept short. Check out the layout of the pool, what is the depth of the pool? More details and tips on how to keep safe in the water this summer can be found on the RLSS website. If you are interested in joining our fantastic swimming programme please Aquatots for more details.